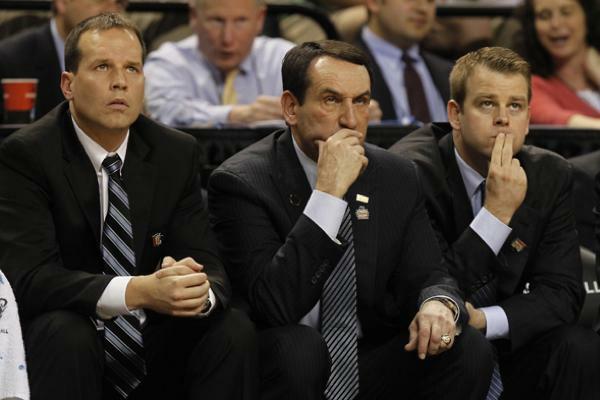 Chris Collins (left) watches a Duke game with fellow coaches Mike Krzyzewski and Steve Wojciechowski. Collins was named Northwestern's head basketball coach Wednesday. Northwestern will officially introduce new men’s basketball coach Chris Collins on Tuesday, the latest chapter in the athletic department’s fast-moving quest to replace Bill Carmody. The 11 a.m. news conference comes two days after Duke, where Collins was an assistant, failed to reach the Final Four in the NCAA Tournament with a 85-63 loss to Louisville. When the NU athletic department announced the Collins hiring Wednesday, it said Collins wouldn’t meet the press until the Blue Devils’ 2013 season ended. Less than six hours after the buzzer rang at the tournament match-up in Indianapolis, the athletic department notified reporters of the upcoming news conference. It will culminate an 11-day process to find and hire the next basketball coach. The news conference will mark the end of a hectic cycle since athletic director Jim Phillips fired Carmody on March 16. The decision came days after the former coach ended a disappointing 13-19 season in his 13th year at the helm of the program. The school subsequently hired the Parker Executive Search firm to lead the search process for a new coach. The Atlanta-based company has helped five other Big Ten schools find basketball coaches. After multiple interviews last week, the school announced Wednesday it had hired Collins as the new coach. Collins was widely considered to be the favorite for the position after Carmody was let go. Collins was reportedly one of the first interviews Phillips conducted, and he was named the coach just a short time after the interview. 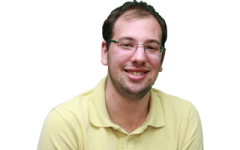 He dined with University President Morton Schapiro on Wednesday night prior to the announcement, according to multiple reports. He took to Twitter shortly after the Blue Devils’ loss to thank Duke coach Mike Krzyzewski and talk about his excitement for the new job. “For 17 years, I have given Duke Basketball my all and I’m so proud of every moment! I can never repay Coach K for what he has meant to me,” Collins tweeted. For 17 years, I have given Duke Basketball my all and I'm so proud of every moment! I can never repay Coach K for what he has meant to me!